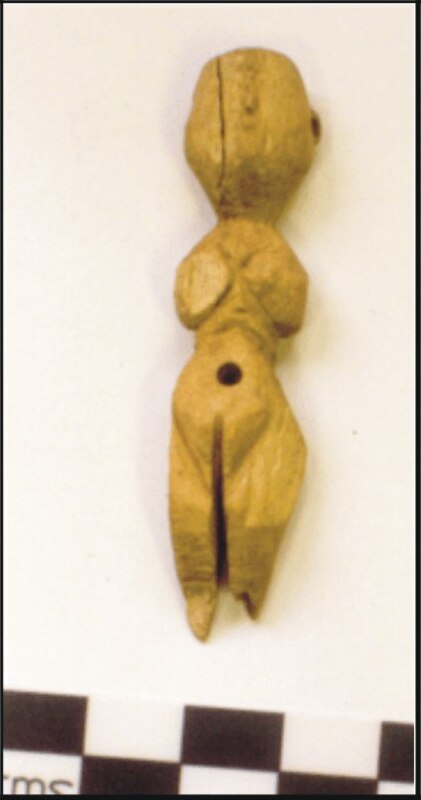 A bone Coptic fertility figure. This bone figure is 56mm high and was found at Armant. Figures of this type seem to date to the 4th to 6th centuries AD in Egypt. They are always female and the breasts and pubic area are clearly defined. It is thought that they were fertility amulets. Woolley saw a similarity in form between some of these objects and Coptic crosses. See Woolley, C. L. 1907. Coptic Bone Figures in Society of Biblical Archaeology Proceedings, Vol XXIX. 218-220 plus 3 plates.